Christie Ultra Series LCD displays have been installed at a striking multipurpose event space at the Institut für Holztechnologie (IHD) in Dresden, Germany. 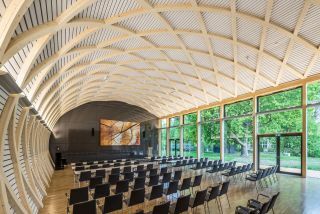 The institute—which researches how to best process wood from raw substance to finished product—made full use of its material of choice in the construction of a light and airy auditorium for presentations, lectures, and events. The room features contemporary architecture, with a diamond-patterned wooden vaulted spruce ceiling, and large window facade overlooking lush green surroundings. With the 13-meter-wide room in regular use throughout the week, a permanent low-maintenance display was required in order to facilitate events in the versatile space. “Our goal was to create a place that can be used for all types of event, from symposia, through to the in-house exhibition, right up to corporate events or private functions,” said Thomas Hupfer, head of IT and DS coordinator at IHD. Having no curtains or blinds to limit glare, the bright room provided a challenge for the AV technology. Although the windows face north, a lot of light reaches the outer rows of seating. In order to ensure clear visibility of the content on the display wall even from the back rows, image sharpness and the option for color calibration were important aspects to consider when choosing appropriate technology. The LCD panels were supplied and installed by Christie partner Matec GmbH, a specialist for high-quality presentation solutions. The displays from the Christie Ultra Series particularly impress with their narrow bezel (3.7mm combined), full HD resolution, high pixel density, and LED backlighting.